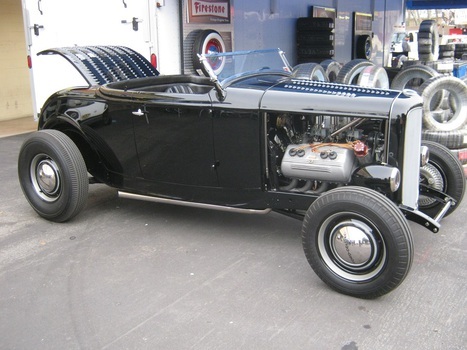 1932 Ford Roadster with an Ardun/Ford hemi V8 - Clayton's classic hot rod's got it right! The Goodguys events draw a substantial number of hot rods – from T-buckets to 32, 33 and 34 roadsters and coupes. All of them are eye catching examples of the builder’s imagination and craftsmanship. Some, however just jump out at you as you walk by. Such is the case with the 32 roadster built by Clayton’s Hot Rods. The very first thing that stops you in your tracks is the Ardun hemi head conversion jutting out from under that hood. Designed and manufactured by the famous Zora Arkus Duntov (of Corvette fame) these overhead valve hemi head conversions for Ford’s venerable flathead V8 were designed in the late 40’s initially to provide more power to Ford engined trucks. Hot rodders soon found they offered a significant improvement on a flathead. The car itself is a masterful work of art. An all steel 32 Ford roadster body – mounted “hiboy" style – sits on a 32 Ford frame. The roadster is painted a flawless black with a louvered hood and trunk. A cut down 32 windscreen and stock 32 grill shell rounds out the exterior. Up front is a 32 axle with original Kinmont brakes and E&J headlights. Stock Ford steelies around with Ford “Deluxe” wheel covers. Going round to the back, is a custom gas tank under that louvered trunk deck. Peering out from under the rear is a Halibrand quick change rear. The 239 cu.in. Flathead engine was built by Don Ferguson who also made the custom intake manifold for the ArDun heads. That intake mounts 3 Stromberg 97 carbs with short velocity stacks. A Vertex magneto supplies spark and the exhaust leaves the heads via custom headers made by Clayton's Hot Rods that end in a long lake pipe under each side rail. The engine transmits its power through a 39 Ford 3-speed transmission with Lincoln Zephyr gears. The interior is as simple and elegant as the exterior. An engine turned 32 Pierce Arrow dash panel mounts the compliment of Stewart Warner gauges for speed, tach, oil, fuel, amp and water temp. The twin bucket seats are custom made aluminum frames – in an aircraft style – covered in black pleated leather – with aircraft style seat belts. The door panels are also in simple black leather with a snap pocket. No Limits talked with Clayton Slaughter who built the rod. Clay said it took about 1 ½ years to complete. One of the most interesting touches on the entire car is that NOTHING is chromed – what looks like chrome is actually highly polished nickel plate. Even the lake pipes are nickel plated. This is a very special touch to an already amazing roadster. We compliment Clay and his crew for building a classic “hi-boy” that captured the late 40’s and early 50’s hot rod period with that ArDun head motor.